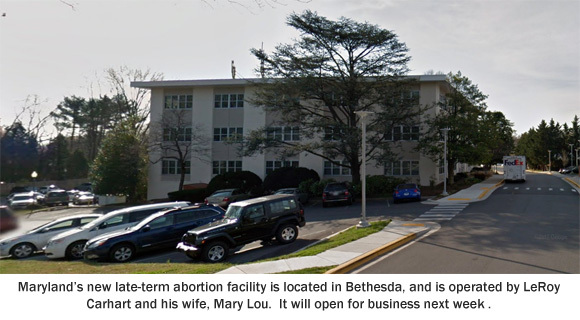 Bethesda, MD – Operation Rescue has learned that Nebraska’s late-term abortionist, LeRoy Carhart, has secured a new office in Bethesda, Maryland, and plans to continue conducting abortions on babies throughout all nine months of pregnancy. Operation Rescue’s researchers conducted an undercover investigation to locate the secret new abortion facility, which is going by the name AbortionClinics.org, Inc. It is located in a multi-tenant medical building at 10401 Old Georgetown Road Suite 104, Bethesda, MD 20814. The new abortion business plans to begin abortions the week of October 16, 2017. “There will be pro-life advocates outside this facility when it opens next week. This neighborhood is about to be in for a real surprise when they realize one of the most notorious late-term abortionists in the nation will be conducting highly unpopular late-second and third trimester abortions in their neighborhood,” said Operation Rescue President Troy Newman. During the nearly seven years Carhart conducted late-term abortions in Germantown, at least ten women were rushed to hospital emergency rooms by ambulance suffering from life-threatening complications to the risky abortion procedures. At one woman, Jennifer Morbelli, died from complications to a 33-week abortion. The opening of this new late-term abortion facility provides new urgency for the Pain Capable Unborn Child Protection Act that now languishes in the U.S. Senate. This legislation, if passed, would protect pre-born babies at twenty weeks gestation and later, which are specifically targeted for abortion by Carhart’s Maryland abortion business. If passed, it’s doubtful if Carhart will be able to stay in business in Maryland, since the later abortions are expensive and highly profitable. Please contact your Senators and urge them to support the Pain Capable Unborn Child Protection Act.